The Storm Prediction Center has placed much of the Washington Area under an Enhanced Risk of Severe Thunderstorms on Monday afternoon. 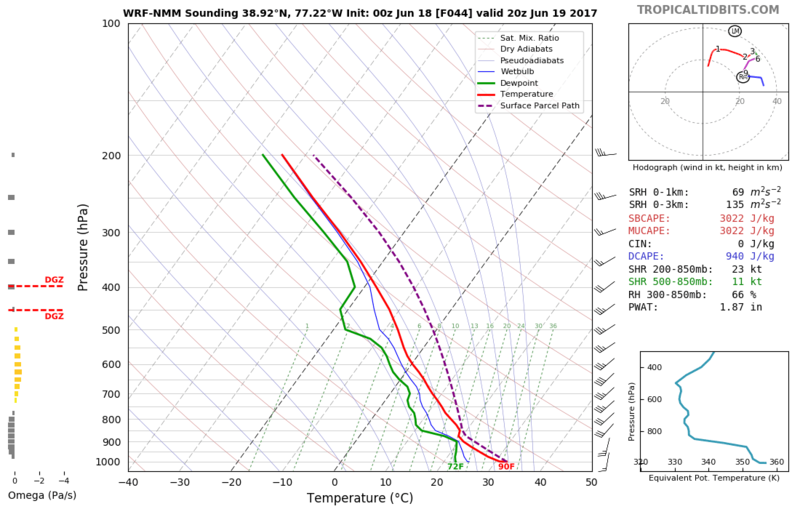 The NAM’s WRF-NMM sounding (image below) indicates a very unstable atmosphere at 4PM Monday. Training thunderstorms are likely as the mid and upper level wind flow out of the southwest will be parallel to the surface front. PWATS will be running nearly 2″ meaning that an extremely moist atmosphere will be able to put down torrential rain in a short period of time. Some mid-level dry air will be capable of promoting wet microburst (damaging downdraft winds that can exceed 70 mph). Large hail will also be possible with steep lapse rates as an upper level trough begins to approach from the Great Lakes. The Tornado threat will be low due to unidirectional shear (thank goodness) but even an isolated tornado can’t be ruled out. Previous Post Previous post:When Will the First Heat Wave of Summer 2017 Break Down? Next Post The DC Region Needs Rain… Potential Increasing Late Next Week. Heavy rain and possible thunder tonight! Isolated flooding concern. This is from the moisture of Cindy. Unless this is a bust, it’s going to be an active weather day tomorrow! I say bust because there are hints that the over-running convection to our west moves into our area tonight, which will allow the atmosphere to stabilize enough preventing the severe threat. However, that will not make the reavy rain go away and I think the NWS will issue flash flood watches for at least parts of our area very soon. We are dry, but this looks like a major event for us.